This is due to work done in bug 563767 (enable Maemo5 qt debs) and bug 563081 (deb repo updates with both chinook and fremantle). These repos should be updated nightly with their corresponding builds. I have seen issues and confusion stemming from having multiple Fennec repos on a single device, so I tend to remove all Mozilla repos from the App Manager, uninstall Fennec+Mozilla Runtime, then click on the appropriate .install file. [EDIT]: I've renamed the .install files in bug 574104. 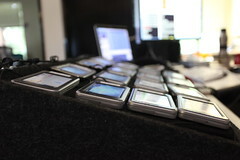 Maemo N810 talos and unit tests are currently available on the TraceMonkey tree. In a way, this is a pooling win. Once Lukas enabled the TraceMonkey Maemo builds, I refactored the mobile buildbot configs and made a few tweaks to get TraceMonkey tests running and reporting using the existing device pool. And now we can catch Maemo breakage before it lands in mozilla-central. Reftest seems to be broken. When I had a device in front of me, I saw the unresponsive script prompt, which may explain that. No bug yet. There aren't enough devices to keep up. This is a multi-part issue. Currently each checkin spawns 10 test suites, the longest of which takes nearly four hours. Afterwards it takes up to a half hour to reboot and reconnect. If we assume a maximum of one checkin in either branch per four and a half hours, 10 functional devices would fully keep up with all checkins. Of course, it's unrealistic to expect developers to throttle their checkins in m-c and TraceMonkey to one checkin per four and a half hours. Unfortunately, it's also currently unrealistic to expect ten devices to be up and running at any one time. Currently there appear to be 4 functional N810s in production. 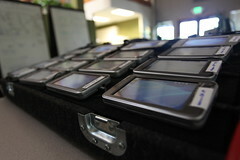 The devices weren't really designed to be an enterprise 24/7 test platform, as evidenced by these Maemo bugs. Adding the stress of running constant tests designed for desktops, and my own undiscovered setup bugs, and we lose several (3-6?) devices a night. Why not buy more? We were considering a pool of 50; if half fell over we'd still be able to handle a large number of builds. The N810 and Diablo might not be the final configuration we end up targeting. Also, until recently, keeping the devices up required hours of daily imaging work. John Ford recently solved bug 502762, creating a custom image for the N810s, which is awesome. There's still a bunch of testing and ironing out to be done, but this should be a massive time saver. Still, this doesn't allow us to keep up with multiple checkins on multiple branches. Or keep devices up overnight. Just bring them back up faster the next day. I heard rumblings of wanting Maemo tests on Try. This would add even more load than an additional branch, as Try builds don't allow for build skipping. We're tracking the N810 stabilization issue in bug 499334. We're working on this while also trying to port tests to two new platforms, and possibly dealing with a new Maemo device. Or, as I call it, 3-5 quarters' worth of work in one quarter's time. Unit tests on Maemo (linux-arm) Fennec are live, viewable on the Mobile tinderbox page. This wouldn't have been possible without the hard work of both Ted and Joel. Previously, I had six Nokia N810s running Talos performance tests (3 running the Tp3 page load test; the other 3 running all the other tests). I triggered all 6 at the same time, build-driven, which resulted in a lot of data for certain builds and no data at all for any builds in between test runs. I knew this wouldn't scale once I added branches and unit tests. There is no depth. If one or two devices fall over, there are no test runs for that test suite until someone intervenes. Having devices fall over is, unfortunately, a not-uncommon event. 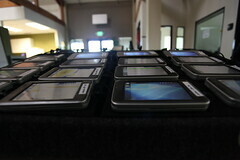 Instead, I image each N810 in the exact same way, so they're each capable of running any and all of the test suites. Once pooled, they're available for any buildbot builder to utilize for pending tests. As long as one N810 remains functional, there will be test data (although much slower throughput than with 14). If these concepts seem familiar, it's because they're the same as what we're doing for Firefox builds and tests. We split the unit tests up out of necessity. A single run of just the Mochitest suite can take 4-6 hours or more on an N810. Adding other test suites to the same builder would delay test results even further. The N810 reboots itself when out of memory. Joel had to "chunk" up certain test suites to avoid oom errors/reboots, just to get the tests to run. Splitting the long test suites (namely Mochitest) into multiple parallel tasks was a natural progression. When pooled, running each test suite individually and splitting Mochitest up into four pieces gives us results much faster than long-running single-threaded tasks. I had to write mobile-specific unit test parsers rather than rely on the existing ones. Since Joel's Maemkit calls run_tests.py multiple times per test suite, the total passed/failed/known numbers at the end of each run are not comprehensive. Since we allow for n number of failed tests per suite, the existence of a "TEST-UNEXPECTED-" string doesn't automatically mean WARNINGS. Instead, I need to m = re.findall("TEST-UNEXPECTED-", string) and compare len(m) against n.
Finally, the numbers on the waterfall (passed/failed/known) are massaged to account for n: I subtract n from the failed number and add it to known. And (hopefully) avoid going negative. This is all a workaround until we figure out how to solve the different numbers of known failures for the disparate products/platforms. There are still some outstanding issues and wanted features above and beyond the above: static IPs for the N810s. Tracking timeouts. Populating a unit test db like Ted's. Otherwise figuring out what causes the reds/crashes and fixing. I think things are in a state where I can leave it alone for a bit, though. I foresee a whole lot of Windows Mobile and Windows CE in my near-term future. First off, hats off to John Ford, who finished try server mobile builds. Now Firefox developers will have better insight as to whether their patch breaks Maemo and WinCE Fennec builds *before* the patch is committed. Finally, this is possibly the end of the Nokia pedalboard, at least as it's currently set up. It's served its purpose well, and has been a definite attention-getter here in building K. But there's an air conditioned shelf reserved in the machine room for the n810s. I suppose we'll see if Windows Mobile devices take over the pedalboard or if I retire it from active mobile device duty. Localized Fennec, filed under "Maemo". * Only in tarball format, on trunk, for linux-arm ("Maemo") for now.